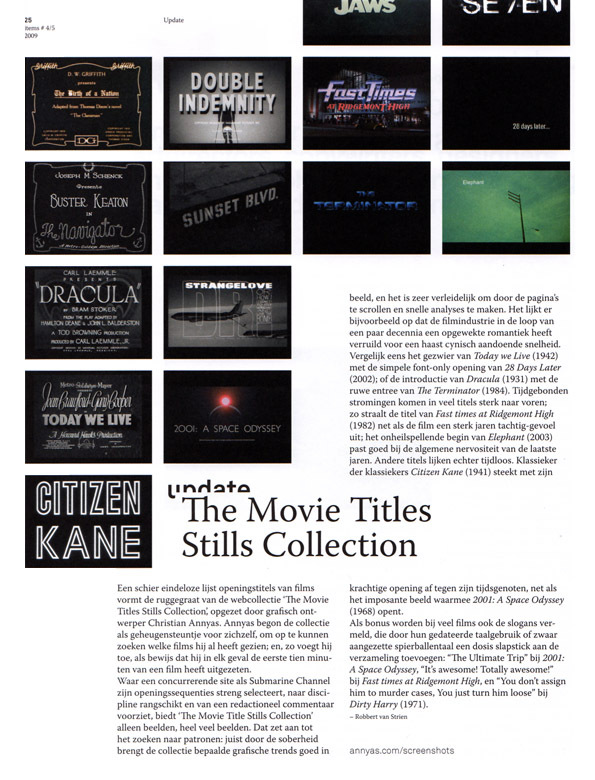 A collection containing stills of titles from feature films and trailers (1902-2013). The collection gathered quite a bit of attention from design portals to newspapers like The Guardian and The New York Times. Below you’ll find the hightlights of what has been written about the collection. THE NEW YORK TIMES Lately, however, there has been renewed interest in the old, static titles, particularly the ones with drop-shadow lettering or metaphoric typography in the shape of trees, stones and jewels. THE GUARDIAN …what emerges from comparing the 1920s to the 2000s is how similar they basically are in form, how little the grammar of film has changed, and how young the artform actually is. Anyway, this website is a treat. CORE 77 …some are masterpieces of hand-lettering.” Heller’s uncovered a website called the Movie Title Stills Collection, which features screengrabs from movies dating from 1920 to the present day. DESIGN REVIVER …a website that is a mixture of good old fashioned quality and modern coolness, that brings the under valued art of Movie Still Photography into the spotlight for a new generation to drool over. IMPRINT – THE DAILY HELLER Christian Annyas, the online curator of all things typographic in cinema, “The Movie Stills Collection,” is publishing a series of blog posts about the typography of French director Jean-Luc Godard, who recently turned 80…. SMASHING MAGAZINE Can the Dutch be proud of its web design community? Is it capable of producing great websites? Has the community earned a place in web design land, or is Dutch web design still in its infancy? Inspiration: web design trends in 2009: Where are we heading? INSPIRED MAG These days is so hard to be original, especially in the web design field. But some of the blogs we came across lately are so totally authentic that we felt the need to showcase some of them in a special post. 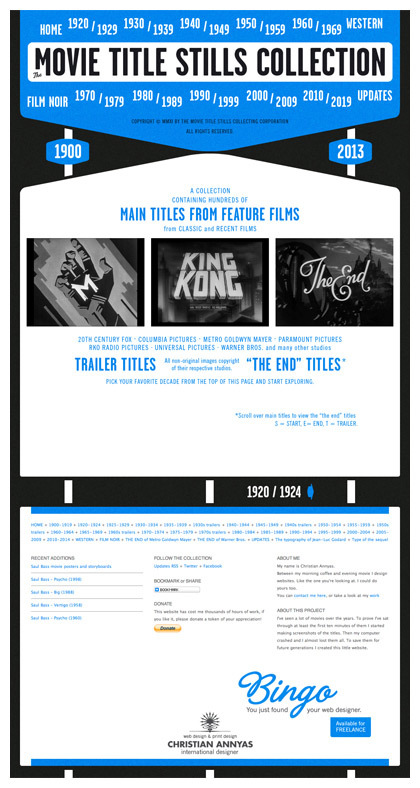 “The End.” 50 years of “The End” cards at, well, the end of Warner Bros. movies. This website may be the death of me, it’s so great! Oh god, this is SUCH a great site. What a great idea.. and an even better design. Wish I had thought of this.. Damn it! This is SUPERB! We can all agree that this is the most beautiful site on the Internet right now hey? Holy crap. Check deze mooie site. Prachtige verzameling movie title stills. Genieten dit! Brilliant! I can’t stop looking at these.